Welcome to our 2018/19 grant cycle. Our online grant application system will begin accepting Letters of Inquiry on September 24, 2018. 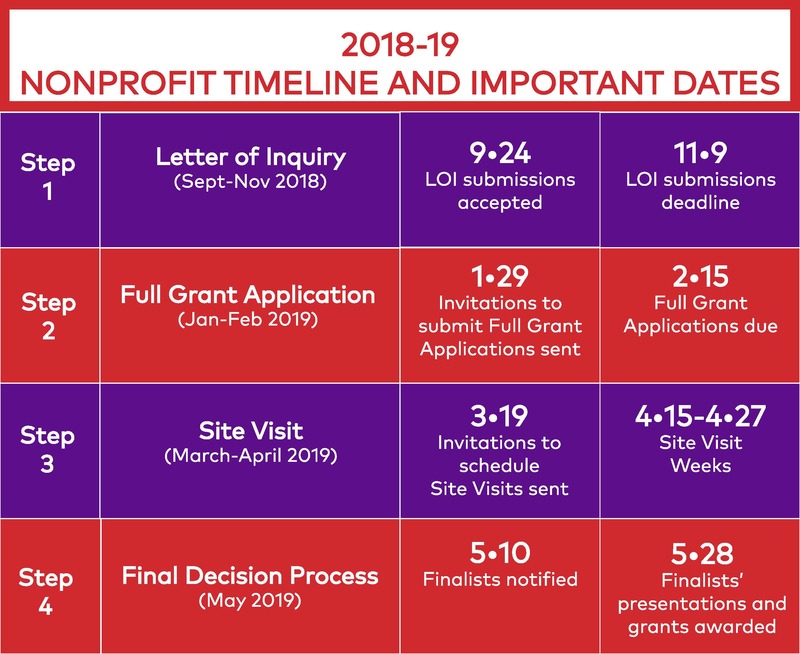 Please check the 2018/19 Nonprofit Timeline and Important Dates for other information and check back in the fall of 2018 for updates. The Impact Grants Chicago grant cycle is a four-step grant application process including a Letter of Inquiry, Full Grant Application, Site Visit and a Final Decision Process. The Nonprofit Timeline and Important Dates chart identifies the important dates included in each step. A more detailed summary of the requirements of each step are outlined below. Applicants must submit a Letter of Inquiry (LOI) through our online grant application system before the deadline set annually by Impact Grants Chicago. The deadline for submitting for the 2018/19 grant cycle is November 9, 2018. Organizations are allowed to submit only one application per year and must select a Focus Area when completing the LOI to verify compliance with our funding criteria. Please review the Focus Area Descriptions on this page for more information. Organizations should review the Eligibility Requirements carefully before completing the LOI. It should be noted that the LOI requires the applicant to complete and attach the following document, which is only available on our website: Letter of Inquiry Project Budget Spreadsheet. Impact Grants Chicago will acknowledge each LOI received. Members join Grant and Financial Review Committees (“member committees”) to analyze all submitted LOI’s. Following the review of the LOIs, Impact Grants Chicago will select certain applicants to submit a Full Grant Application. Impact Grants Chicago will acknowledge each Full Grant Application received. The member committees will review the Full Grant Applications and, following the review, semi-finalists will be notified that they have been selected for site visits. Applicants will be notified on March 19, 2019 whether or not they have been selected for a site visit. Impact Grants Chicago will contact applicants to schedule site visits, which will take place between April 15 and April 27, 2019. The objective of the site visit is to complete a general due diligence review and to investigate and resolve any final questions. Site visits require approximately two hours of dedicated time and should include participation of the Executive Director, Project or Program Manager, Financial Officer or Treasurer and a Board Member. Following the completion of the site visits, the member committees of Impact Grants Chicago will select the finalists. Finalists will be notified on May 10, 2019 and announced to the public on May 13, 2019. Finalists will receive guidelines for making presentations at the annual Grant Awards Celebration. Impact Grants Chicago members will vote to select the $100,000 Impact Grant recipients at the Grant Awards Celebration on May 28, 2019. The voting results will be tabulated and the grant award recipients will be announced at the event. Terms and conditions of the distribution of the Impact Grants will be set forth in Grant Agreements. Click here to view a template of the Impact Grants Chicago Grant Agreement.